Richard Clapton is one of Australia’s foremost singer/songwriters. Clapton paved the way for three generations of songwriters to write about the experience of being Australian. When he began his recording career in 1973, Australia was still in vice-like grip of the cultural cringe. He plunged into the deep water and in his wake followed the Skyhooks and Paul Kelly, Cold Chisel, INXS, Midnight Oil and hundreds of others. Clapton’s songs are still on the radio. His records chart the political landscape of the nation and the turbulent lives of two generations. Clapton grew up in Sydney in the 1960s. He hopped a plane for London and then later to Germany where he wrote a first album, Prussian Blue (1973). It was the first major “singer-songwriter” album in Australia. In 1975, Clapton had the critics on side, but Festival Records insisted on a hit single. However, it was the song they picked as a b-side called “Girls On the Avenue” that reached #2 on the national charts and put Clapton at the top of his class. Like Americans Jackson Browne and Bruce Springsteen, Richard Clapton developed a sound based on melodic rock while his lyrics were poetic musings on his state of mind or the state of the nation. By 1975, Clapton had set the themes he was to explore for the coming three decades. There were frequent escapes to his spiritual second home in Berlin to recharge and get a fresh perspective on Australia; there was Clapton’s love/hate relationship with the pop music culture; his often-tormented sense of growing up and his eye for the political landscape and how it affected Australians. Clapton mastered that most difficult of showbusiness acts – the highwire that requires the balance of radio-friendly tunes and candid, from-the-heart lyrics. These two came together on the Goodbye Tiger album; then Clapton’s most successful to date. The record was a new highpoint and there was significant international interest in Richard as a recording artist. A period living overseas brought forth the sophisticated Hearts on the Nightline. Then back in Australia in 1980 he released the searing Dark Spaces, an indictment on the meanness and mendacity that would blow through the 1980s. 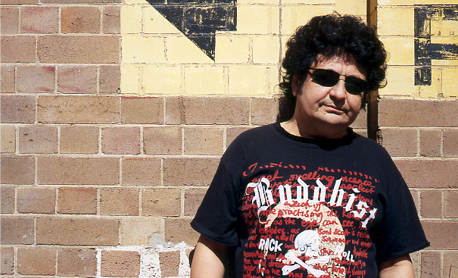 Ten years after his first release, Richard Clapton was a tribal elder to whom younger artists like Jimmy Barnes, INXS and Cold Chisel turned as a mentor. INXS asked Clapton to produce their second album, Underneath the Colours, and they became firm friends. They, and Cold Chisel, returned the favour on Clapton’s The Great Escape album. INXS drummer Jon Farriss produced The Glory Road album, and few records capture the roller coaster ride of the late 1980s as well as Glory Road. These albums brought Clapton’s melodic gifts and his love of electric rock & roll into lockstep. There were always the words though. No one better documented the 1980s than Richard. Richard frequently went to the edge ? emotionally, politically, financially ? and sent back his incisive postcards. In the 1990s Richard continued to write and record and tour. However, for much of the decade he was plagued with lawsuits. Many of his early contracts were drawn up in the dark ages of the music business and they required untangling. Richard also found domestic harmony with wife Susie and their two daughters. His 1990s songs reflect a hard-won maturity. Indeed, Richard counts 2003’s Diamond Mine as amongst his best albums – and the critics unanimously agreed. In 2005 he set about making the first acoustic album of his career. Clapton stripped back some of his favourite songs – reimagining them in a different environment. The result is his 17th album – REWIRED. This project was never intended to be a greatest hits record – and indeed many of his greatest hits aren’t here. It’s an experiment in hearing Richard Clapton in a new way.